This is the seventh all-time meeting between these schools. Four games took place when both were 1AA members from 1997-2000. In the two meetings as FBS members in 2009-’10, USF won both SU (0-2 ATS). USF leads the series 4-2 SU. 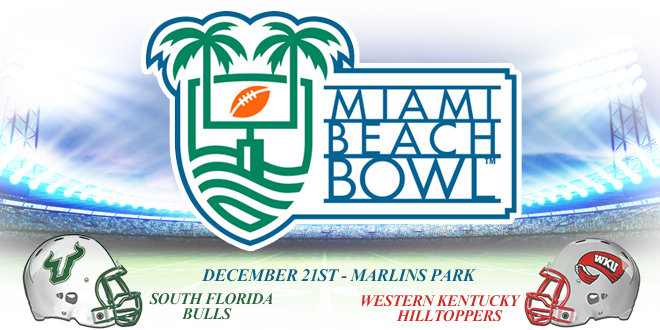 This is the second Miami Beach Bowl. USF went to 6 straight bowls (4-2) from 2005-2010, but this is their first since. Head coach Willie Taggert ironically led WKU to their first bowl as their head coach in 2012, but didn’t coach the game (hired by USF) so this will be his first ever bowl game. WKU lost that game in 2012, but Head coach Jeff Brohm led them to a bowl win last year, 49-48 (-3’) over Central Michigan in the Bahamas Bowl, a game they led 49-14 in the fourth quarter. Things looked bleak early on for USF as they started the season 1-3 and were trying to find an identity on offense (just four returning starters) as they had two new Co-offensive coordinator’s. They then shifted back to more of a pro-style and won three straight before falling to Navy on the road. The Bulls then closed the season with four straight wins, despite being a ‘dog in three and just missed the AAC championship game! Over those final four, they were plus 26 points per game and plus 195 yards per game, while averaging 504 yards per game, including 303 rushing yards per game (5.6). Running Back Marlon Mack finished with eight games over 100 rushing yards. WKU was the favorite to win CUSA as they were the first team in FBS history to have a 4,500 yard passer (Brandon Doughty) and 1,500 yard rusher (Leon Allen) and both returned. Allen was injured and lost for the year versus Louisiana Tech and Anthony Wales took over versus Middle Tennessee and finished with five 100 yard game, while Doughty again threw for over 4,500 yards! Their lone losses were on the road at Indiana & LSU, but they were out-gained by less then 100 yards in each and had the fourth most yards LSU allowed all season! WKU indeed was the CUSA Champ and are No. 10 in the FBS averaging 121 yards per game more then their foes allow and posted the most yards allowed by their opponents in five games. Both of these teams enter this game playing extremely well. USF figures to have the crowd edge as their campus is just 207 miles away. Against bowl teams WKU is plus 83 yards per game, while USF is minus 25 yards per game, but the Bulls led by a combined score of 82-13 at halftime against Temple and Cincinnati, two solid bowl teams. The Bulls have the edge on defense.